Identification: Moyle (1976a); Becker (1983); Page and Burr (1991); Etnier and Starnes (1993); Jenkins and Burkhead (1994). Native Range: So widely introduced that native range is difficult to determine; presumably Atlantic Slope from Virginia to Florida, Gulf Slope west to Texas, St. Lawrence, Great Lakes and Mississippi River basins from Quebec to Manitoba south to the Gulf (Page and Burr 1991). Table 1. States with nonindigenous occurrences, the earliest and latest observations in each state, and the tally and names of HUCs with observations†. Names and dates are hyperlinked to their relevant specimen records. The list of references for all nonindigenous occurrences of Pomoxis nigromaculatus are found here. Means of Introduction: Its popularity as a sport fish has led to stockings throughout the west and northeast. Intentional stocking for sportfishing. Status: Established in most or all states where it has been introduced. 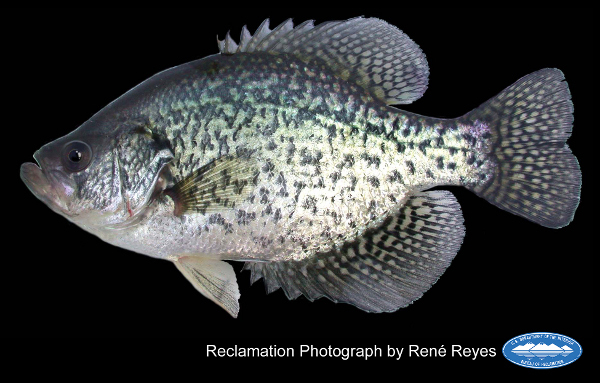 Impact of Introduction: Black Crappie prey on threatened and endangered juvenile salmon that spawn in rivers of the Northwest United States and may further contribute to salmon decline through habitat alteration, though the extent of those impacts are unknown (Sanderson et al. 2009). Nonnative predators, including crappie, have been shown to reduce the abundance and diversity of native prey species in several Pacific Northwest rivers (Hughes and Herlihy 2012). Bradley W. G. and J. E. Deacon. 1967. The biotic communities of southern Nevada. Nevada State Museum Anthropological Papers No. 13, Part 4. 201-273. Cross, F.B., and J.T. Collins. 1995. Fishes in Kansas. University of Kansas Natural History Museum, Lawrence, KS. 316 pp. Madison, D. 2003. Outlaw Introductions. Montana Outdoors. July/August: 26-35. Sigler, F.F. and R.R. Miller. 1963. Fishes of Utah. Utah Department of Fish and Game. Salt Lake City, Utah. 203 pp. Simon, J.R. 1946. Wyoming Fishes. Wyoming Game and Fish Dept., Bull. No. 4. 1-129+ pp. Urbain, B. 2001. Personal communication.